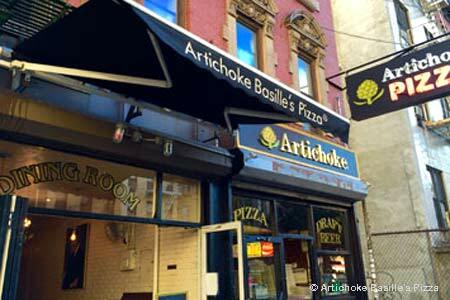 East Village buzz-worthy take-away pizza spot is worth the wait. : Expect a line out the door of this East Village take-away pizzeria --- as there almost always is --- but you won’t regret waiting along with everyone else. We suggest the creamy artichoke-laden pie or the simple margherita, slathered with tangy and sweet San Marzano tomato sauce and basil so fresh you’d swear it was just picked a few hours ago outside of Genoa. The place's namesake, the artichoke, stuffed with bread crumbs and cheese and then doused with garlic oil, is worth the price of admission (which, by the way, is that very slow-moving line). Note: This restaurant was formerly located at 328 E. 14th St. Other locations.